DUMBARTON'S resurgence since the appointment of Ian Murray as manager continued with a shock 2-0 win over promotion contenders Partick Thistle at the Bet Butler Stadium. DUMBARTON'S resurgence since the appointment of Ian Murray as manager continued with a shock 2-0 win over promotion contenders Partick Thistle at the Bet Butler Stadium in front of a 1,500 crowd. With away wins over Falkirk and Morton followed by a close contest but narrow 1-0 home defeat at the hands of Dunfermline Athletic, Sons are growing in confidence and it showed on a dark afternoon. 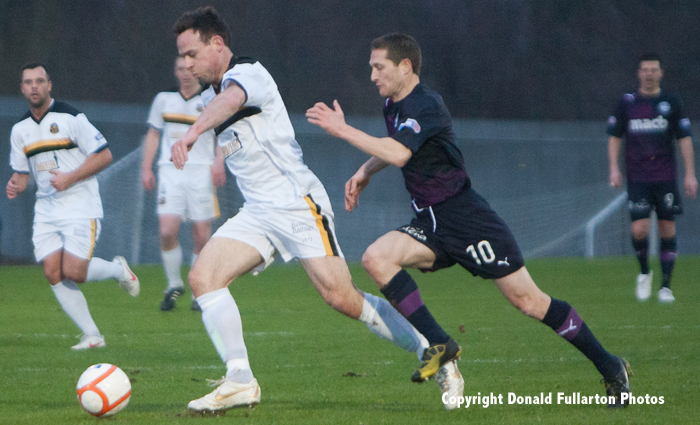 There were chances at both ends before Dumbarton opened the scoring. Centre half Alan Lithgow rose to send in a powerful header which struck the post, then rebounded into the net off defender Conrad Balatoni. The fast-breaking Jags fought hard for an equaliser, and keeper Jamie Ewings had to be at his best to foil them. However just before half-time the keeper had to go off with a leg injury, and he was replaced by Stephen Grindlay. After the break the visitors set up attack after attack on both wings, but they lacked potency when the ball was played into the goalmouth. In one of their rare second half attacks Sons debut full back Scott Smith sent in a cross which Jim Lister passed to Bryan Prunty, and the striker made his 30th birthday complete by shooting past keeper Scott Fox for a second goal which proved to be decisive. The picture shows Jim Lister charging forward.